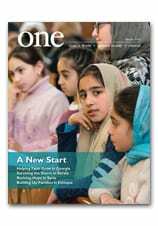 Don Duncan reports on the economic crisis in Greece in the Winter issue of ONE. Here, he gives further insight into the country and its struggles. Since the global financial crisis hit in 2008 and the Euro-crisis loomed soon after, Greece and my native Ireland — along with Portugal, Italy and Spain — have often been used in the same sentence to convey how bad things can get in the new global financial order. Both Greece and Ireland are relatively small compared to the major European Union powers; both experienced stellar economic growth prior to the crisis, mismanagement of that growth by their respective governments and property bubbles that burst spectacularly. Both countries received bailouts and will have to deal with the consequences of those bailouts for years to come. I live abroad in Brussels now, but I have become very familiar with the depth and evolution of the Irish recession on my many visits home since 2008. So on this, my first trip to Greece, I expected to encounter a similar landscape of survival, solidarity and hardship. And I did, only I was shocked by just how much worse things are in Greece. Ireland’s problem seems to have plateaued recently. While the country is still in bad shape, a cautious, quiet kind of optimism is creeping in and people are beginning to look forward again with a little hope. In Greece, it seems people are still waiting for the country to “reach the bottom” of the crisis. The government is still enacting austerity measures imposed by the “Troika” of the European Commission, the European Central Bank and the International Monetary Fund — measures meeting huge opposition and discontentment in the streets. Unemployment is high, angry graffiti still flanks the street, a xenophobic right-wing nationalist current is growing, as is the flow of migrants who enter Greece — and, by extension, the E.U. — from places like the Horn of Africa, Afghanistan, Bangladesh and, more recently, Syria. Middle class families can often be found in soup kitchens, getting food so as to save enough money to cover health bills. The social safety net, for most of the population, is but a distant memory. Suicide is on a sharp increase. But most of all, the general mood on the street is one of sadness and fatigue. It is something you don’t need to hear or be told about, it is written on people’s faces as they go about their day. Things are not, and have never been, this bad in Ireland; the country was never gripped by as deep a mood of gloom and hopelessness. This is not to say that Ireland has not suffered. It has, and it still does. Many of its young, two of my sisters included, have had to emigrate, and this mass emigration has been one ingredient in the vague buoying of the economy — unemployment has fallen and remittance money has started flowing into the country. The sad, desperate pressure valve that is emigration appears to be less considered by young Greeks, many of whom prefer to move in with their parents to reduce costs rather than take the radical step of leaving the country indefinitely. On my arrival back in Brussels, I Skyped with my sister, who now lives in Mackay, Australia. We were talking about the situation in Ireland and if and when she might even consider moving home. I assured her that her eventual return might not be as far off as she thinks. Telling her about what I saw in Greece, I reminded her that things could be worse and that it is always worthwhile to view bad times in a larger perspective. I think this even applies to the Greeks; their crisis will end, eventually. The key now is whether they can work together to weather the storm.